Protests get underway at the Democratic National Convention. THE DEMOCRATIC NATIONAL Convention gets underway in Philadelphia today with much bigger demonstrations than the Republican convention. Die-hard Bernie Sanders supporters have descended on Philadelphia with many so irate with party flagbearer Hillary Clinton that they are prepared to contemplate the once-inconceivable alternative: President Donald Trump. “The system, as Trump says, is rigged,” said Shana Lin, a housewife from Virginia Beach who held a sign that read “You lost me at Hillary” as fellow “Berners” flooded the streets in the shadow of City Hall. “Actually, at this point, I think Trump is a marginal step up, because (Clinton) has proven to lie to the American people over and over,” she added. 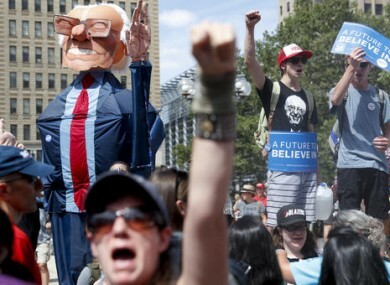 Several thousand protesters, many of them ardent Sanders backers, held demonstrations in Philadelphia far larger than any seen in Cleveland during the Republican convention. It was clear the anger about Clinton winning the nomination has not abated, with Sanders supporters arguing Clinton’s corralling of so-called superdelegates — party grandees who can vote for whomever they wish at the convention — gave her unfair advantage. “The democratic process was stolen from us,” steamed Steffanie Greer, 42, a massage therapist from Brooklyn. Most supporters of Sanders, who entered the race as an avuncular fringe candidate before gaining vast popular support, consider themselves on the opposite side of the political spectrum from the brash billionaire real estate tycoon who secured the Republican presidential nomination last week. They chanted “Hell No, DNC, we won’t vote for Hillary” and “This is what democracy looks like”. Though planned for months, the marches came as fractures appeared in the party that had been trying to display a show of unity in recent weeks. Debbie Wasserman Schultz resigned Sunday as Democratic Party chair over an email suggesting the DNC had played favourites for Clinton during the primary. The Democrats had been trying to avoid the divide that was apparent in Cleveland during the Republican National Convention last week. But the hacked emails, published by Wikileaks, further fired up Sanders supporters, who long accused the party of favuoring Clinton despite officially being neutral. Sanders had called for Wasserman Schultz’s resignation, and said last night she made the right decision for the party’s future by resigning. Darcy Samek, 54, traveled alone from Minneapolis to protest through the four-day convention. “Everyone kind of knew (the Democratic party was against Bernie Sanders), but that doesn’t mean it will change now that it’s proven. It’s just more of the same,” she said. Philadelphia police called yesterday’s protests, peaceful, and said they were pleased with how things were going, so far. More than 5,000 delegates are among the 50,000 people set to attend the four-day convention, which is expected to culminate with Clinton being named the party’s official nominee for president. Email “Democratic National Convention kicks off in Philadelphia with huge protests ”. Feedback on “Democratic National Convention kicks off in Philadelphia with huge protests ”.